There is a 50 ticket limit per customer. For every one (1) ticket selected, two (2) tickets will be sent to you after successfully processing your order. Valid for admission to any 2019 Outdoor Street Food Cinema event in Los Angeles. Not valid for overnight camping or indoor screening events. Check our calendar for screening dates! It's more than just a movie! Street Food Cinema features cool outdoor movies, picnic-ready food trucks, live music from emerging artists, interactive games and more! 2019 marks the eighth season with over 15 locations. Rock the field and share the experience. ABOUT: An offbeat romantic comedy about a woman who doesn't believe true love exists, and the young man who falls for her. 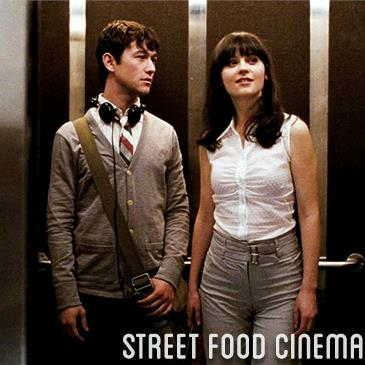 LIVE MUSIC: Visit www.streetfoodcinema.com/500-days-of-summer/ for the most current Live Music listing! FOOD TRUCKS: Visit www.streetfoodcinema.com/500-days-of-summer/ for the most current Food Truck listing! PARKING: Parking Passes available online only through ticket add-on ($10). Limited quantity. Cash only $15 for onsite parking. Cars without a parking pass will not be permitted to park. Suggested lot adjacent to the park. Follow signage to park. Free street parking.